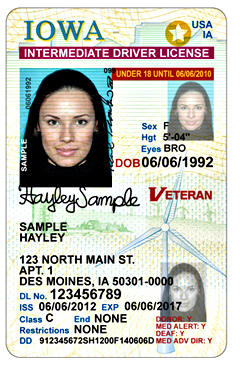 Sample of a new REAL ID driver’s license. The Iowa Department of Transportation plans to begin offering what’s known as the REAL ID driver’s license later this month. Mark Lowe, the director of the DOT’s Motor Division, says the new license is federally mandated. “Real ID is really just a regular Iowa driver’s license or non-operators identification card that we have marked to show that when we issued it we were in compliance with federal guidelines for secure issuance of driver’s licenses or ID’s,” Lowe explains. “So really nothing new in terms of what a driver’s license or ID is, but it signifies that we have met certain federal requirements and when the person came, they provided documents that met the federal requirements.” Congress created the REAL ID program in an effort to prevent terrorist attacks. “The purpose of this is to expedite access to federally controlled facilities for what’s called official federal purposes. So the official federal purposes are boarding commercial aircraft, entering federal facilities that require an identification to enter, or entering nuclear power plants,” Lowe says. The program is controversial as some say it is part of an effort to create a national ID. Lowe answers by saying the program merely asks for documentation that is already used to verify a person’s residency. “Which for most folks is going to be a birth certificate, or a passport or passport card, certificate of naturalization, certificate of citizenship, that type of thing. We are going to ask for a document that shows what your Social Security number is, which is your Social Security card, a W-2 a 10-99 something like that,” Lowe says. The REAL ID will have a star in the corner to identify it. Lowe says young drivers getting their first license will automatically get the REAL ID, but others have a choice. “As a new applicant since you are already going through the process and once you are successful, we are going to go ahead and put a REAL ID star on your document. 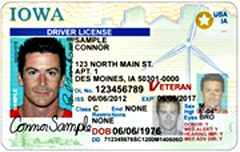 But for someone who has had an Iowa driver’s license for a long time, when you come in to renew, you can decide if you want to go through that process,” according to Lowe. He says if you don’t want the REAL ID, you just bring in your old driver’s license. The DOT has an information section on the REAL ID on their website. “That explains the program, helps you understand why you may or may not need one and how to make that decision,” he says. “And we’ve also created a document finder application that lets somebody that is coming in that either is a new applicant, or somebody that has a license that wants upgrade to a REAL ID. It just helps them intuitively go through the documents they’ll need.” The sate will start issuing the new licenses on January 15th. Lowe says there is no additional fee to get a REAL ID. To learn more go to the Iowa DOT’s website at :www.iowadot.gov.